Studies show it does what lutein, zeaxanthin and beta carotene cannot do. If you suffer from vision problems, here's amazing news. Thanks to a Nobel Prize winner's observation, scientists have discovered a new vision-enhancing nutrient that lets you see clearer and focus more easily. In fact, latest research shows it's many times more effective at trapping free radicals than beta carotene, vitamin E and vitamin C. It's even more potent than lutein and zeaxanthin. In over 40 years of practicing medicine, I've never seen anything like this for protecting and nourishing your eyes. As you may know, carotenoids are pigments that give many foods their beautiful color. That succulent corn you eat on the cob is yellow because of a carotenoid called zeaxanthin. That juicy tomato you have in salad is red because of lycopene. And of course, the carrots you crunch are orange because of beta carotene. Beta carotene is the most widely researched carotenoid. That's mainly because it's converted into Vitamin A… and Vitamin A performs many critical functions in your eyes, including help with blurry vision and sore eyes. Today, it's common knowledge that Vitamin A helps your eyes. Not until a Harvard professor found the presence of Vitamin A in the retina and was awarded the Nobel Prize in Medicine. Today, he is regarded as one of the top scientists of the 20th Century. This professor's name is Dr. George Wald. As part of his research, Wald studied the retinas of cattle, sheep and pigs. He also examined salmon, tadpoles and lobsters. Lobsters held an unusual fascination for him — especially the color change they undergo when they're boiled. Unable to find an explanation behind the color change, he posed the question to the scientific community. The full gravity of Wald's observation didn't become clear until 62 years later when a British research team found the answer. As it turns out, scientists have discovered the nutrient involved in the color change is the most potent antioxidant in nature — beating out every other antioxidant ever studied previously by a wide margin! This antioxidant is called astaxanthin (as-te-zan-then). And today it's dubbed the "King of Carotenoids." This is exciting news for poor vision sufferers because research shows astaxanthin hammers free radicals and enhances blood circulation. It also shields your macula from age-related vision loss, enhances your eye's ability to focus and reduces eye fatigue. In today's world, our eyes are subjected to an unprecedented onslaught of pollution, stress and U.V. light. This leads to what's called "singlet oxygen" damage to the eye. Just as metal oxidizes and rusts away, excess singlet oxygen acts as free radicals that harm your cells. That's when antioxidants are needed because they "de-rust" your body. Unfortunately, most antioxidants — even Vitamin A — cannot quench singlet oxygen. It's time to tell you about the breakthrough by scientists at Johns Hopkins. Much like the Nobel Prize winning discovery of Vitamin A in the retina, this discovery will forever change the world of vision research. As you may know, there are protective sheaths around the brain and retina that protect them from damage. These are called the blood-brain barrier and the blood-retina barrier. Among other things, they keep out harmful fungi and bacteria. Unfortunately, they also keep out most antioxidants. Which is why vision problems are so difficult to treat. Even beta carotene — the most well known carotenoid — cannot penetrate them. Neither can lycopene. Or vitamin E.
But in a landmark study, researchers at Johns Hopkins found astaxanthin can! Researchers gave 6 doses of astaxanthin to healthy rats for 3 days. After 3 days the rat's retinas were examined for the presence of astaxanthin. Because astaxanthin does not naturally occur in the retina, the researchers didn't expect to find any in the eye. But after examining the rats they were stunned to find heavy doses of astaxanthin long after the last dose! 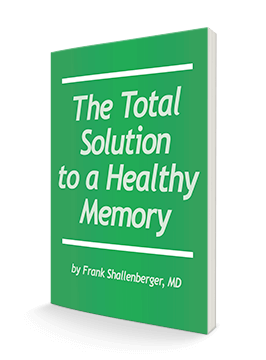 Unlike other antioxidants, astaxanthin is able to cross the blood-brain barrier and get into the brain. Then, once in the brain, it crosses the blood-retina barrier and reaches deep into the retina and the macula where it does the most good! For years researchers have searched for a carotenoid antioxidant — among the 600 naturally-occurring carotenoids known to them — that's able to quench excess singlet oxygen and pass the blood-brain and blood-retina barriers. And now for the first time ever they've found it! The results of this experiment were so impressive, this same team of scientists decided to do further research. In another study, they took rats and placed them on a twelve hour cycle of light and darkness for two weeks. Half of the rats were given doses of astaxanthin. The other half were given a placebo. Then all of them were exposed to vision-damaging light non-stop for 24 hours. After a two-day rest period the thickness of the exposed rats' retinas were compared to a normal eye. And what researchers found shocked them: results using rats showed that astaxanthin provides almost 100% protection against light damage and inflammation. Where the thickness of the placebo group's retinas withered away by 29%, the astaxanthin group lost hardly any thickness at all. Remember, this is after exposure to direct sunlight for 24 hours straight. 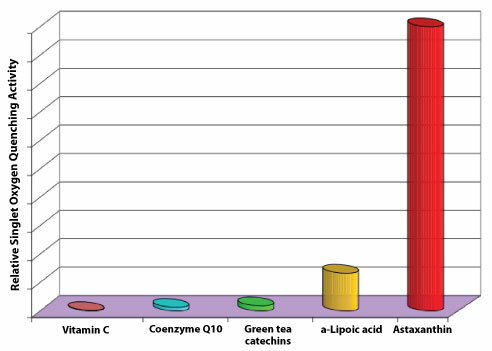 Are you starting to understand why astaxanthin is #1 on my list of top vision nutrients? Eye fatigue is a recurring problem for millions of people across America. It's estimated that 82% of people who regularly use iPads, mobile phones and computers experience eye strain, eye fatigue and headaches. Thankfully astaxanthin can help relieve dry eyes and blurring. It even helps with double vision. In fact, people who take astaxanthin report being able to see clearer and sharper. In another double blind study, 10 people were broken up into two groups. Both groups were given a battery of vision exams for 20 minutes. Then they were tested for symptoms of eye strain. The difference was one group took astaxanthin and the others did not. After 14 days, they were given the same eye tests. When researchers analyzed the results they were blown away to discover almost everyone in the placebo group reported dryness, blurry vision and fatigue. Yet those taking astaxanthin reported hardly any symptoms of eye strain whatsoever. So far at least 9 positive human clinical studies have been published in the area of eye strain. All of them showing glowing reports. Truth is, we're just beginning to understand the wonderful array of benefits astaxanthin delivers to eyes and the rest of your body. But you can't head down to the local health food store and buy it off the shelf. That's because most manufacturers source astaxanthin from crustaceans or salmon. Which means you only get puny doses of astaxanthin. The best astaxanthin comes from a little known mirco algae found off the Hawaiian coast. This microalgae is called Haematococcus pluvialis… and it's up to 250 times more potent! Thankfully, you don't have to worry about taking inferior sources of astaxanthin. Because my friends at Advanced Bionutritionals have added AstaPure ® brand astaxanthin sourced from this powerful micro algae to Advanced Vision Formula. This is an entirely new and updated formulation. Advanced Vision Formula is a simple all-natural solution that helps to … Unleash a surge of energy in your eyes (and improves eye strain). Advanced Vision Formula is the only formulation I recommend to patients for relieving tired, weak eyes… reducing fatigue caused by eyestrain… and supporting eyesight for years to come. And it contains all the essential nutrients and antioxidants eyes need for clearer, sharper vision. Let's discuss each in turn. Recent studies also show this amazing nutrient helps avoid devastating vision loss in ways scientists never dreamed of before. So, what is this nutrient? Bilberry. Yes, bilberry. You may already know that bilberry is a potent antioxidant that improves night vision and that WWII fighter pilots took it to enhance visual acuity. In one study, researchers took a group of people and gave them eye tests. They then gave half the people bilberry and half a placebo. Fifteen days later, they administered another round of eye tests. What the researchers found astonished them: The group taking bilberry improved their eyesight by a staggering 83%! In another study, researchers gave doses of bilberry and vitamin E to 50 patients. In 48 cases out of 50, tissue strength and blood flow to the eyes were enhanced, as was recovery from glare. That's a stunning 96% success rate! And in a final study, Italian researchers conducted a comprehensive review of 332 articles about bilberry and its role in vision improvement. Time and time again they discovered a startling fact: bilberry has a significant effect on strengthening the collagen around the eyes, helping to relieve eyestrain and blurry vision. So far, at least 30 studies have been published on bilberry for improving vision health. And all 30 have found it to be effective. Did you know that your eyes already have built-in vision protection? It's true. When your eyes are healthy, they're loaded with substances that protect the millions of photoreceptor cells essential for clear vision. These substances are called carotenoids. And they protect your photoreceptors from the dangers of excess ultraviolet light. Carotenoids can be found in foods like broccoli, corn and dark leafy green vegetables. 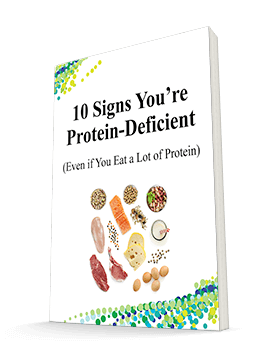 Unfortunately, most people don't get enough of these in their diet. So as we age these carotenoids drop in number and we begin to experience a loss of vision. Objects also appear blurry and our eyes dry out. The good news is studies show that adding carotenoids to your eyes protects your macula and improves early vision loss. So you see almost as clear as when you were younger! In a 5-year study of 400 people, researchers found the carotenoid lutein preserved macular pigments and helped prevent blurry vision. In a study partly funded by the National Institutes of Health (NIH), researchers took diagnostic eye photographs of 4,036 people. They then ranked each participant's intake of several nutrients — lutein included — to assess their effect on eye health. Result: Among all the nutrients examined, lutein was one of the most effective for protecting eyes against progressive vision loss. In spite of these studies, many vision formulas skimp on lutein… or leave it out completely! But I've made sure to include Lutein in Advanced Vision Formula. In fact, I've given you 10mg of lutein — more than enough to protect your eyes. Insulating the brain's visual cortex from free radicals… so your eyes convert visual information into images. Protecting eyes from destructive excess UV light and slowing down vision loss. Infusing the retina with light and making everything you see clearer and brighter. As you can see, zeaxanthin is powerful. Which is why you get 3 mg in Advanced Vision Formula — up to double the dosage of other vision formulas. But it's even more effective when it's combined with lutein. Together they're like a "one-two" punch against vision loss. So before long blind spots can disappear, faces can become clear and you can win back control of your life. Plus, you'll be disrupting the processes that cause macular damage. As we get older, our blood circulation works less efficiently. So less oxygen rich blood flows through our tiny capillaries to all parts of our body — our eyes included. So it's no surprise that vision nutrients work best when your blood is flowing better. The good news is scientists have found one herb that boosts the vision-supporting power of other nutrients. They've discovered this herb can boost blood flow to the most important parts of your eyes. This herb is called Gingko Biloba. You probably already know gingko specimens in China have been found to live up to 2,500 years, and that gingko is shown to improve memory and concentration. But did you know over 20 different studies show gingko can improve your eyesight? In one study, patients started taking gingko daily. Patients showed a marked improvement in their vision after just 4 weeks. In another study, patients with a chronic lack of blood flow to their retinas improved their vision by taking gingko. It's no wonder I'm convinced gingko can make a big difference in your vision. I recommend you take 120 mg per day. Protecting your retina is one of the most critical things you can do to maintain your vision and your independence. I'd go as far as to say a damaged retina means living a restricted life. Why? Because your retina contains millions of photoreceptors that capture light rays that are then converted into electrical impulses. These impulses travel along the optic nerve to the brain where they are turned into images — the same images that let you read these words… play golf… drive your car… watch TV and sports… read a travel brochure and much, much more. So when researchers in Japan discovered an antioxidant that improves worn out retinal tissues, doctors around the world took notice. First, they added L-Taurine to cells. Then they incubated and transferred the cells to 3 different mediums. Finally they examined the cells under a high-powered microscope. And what researchers discovered shocked them: In just 120 days they found that L-Taurine actually improved worn retinal tissue! In addition, L-Taurine protects eyes from harmful excess UV light and helps the optic nerve function at its peak. Surprisingly though, you'd be hard pressed to find L-Taurine in most vision formulations. That's why I've made sure to include it in Advanced Vision Formula in the right form and amount. Just imagine being able to see, enjoy and take part in all the activities you love most. Well, L-Taurine makes it possible! If the ingredients in Advanced Vision Formula only included the ones I've spoken of so far, it would be one of the best formulations on the market. 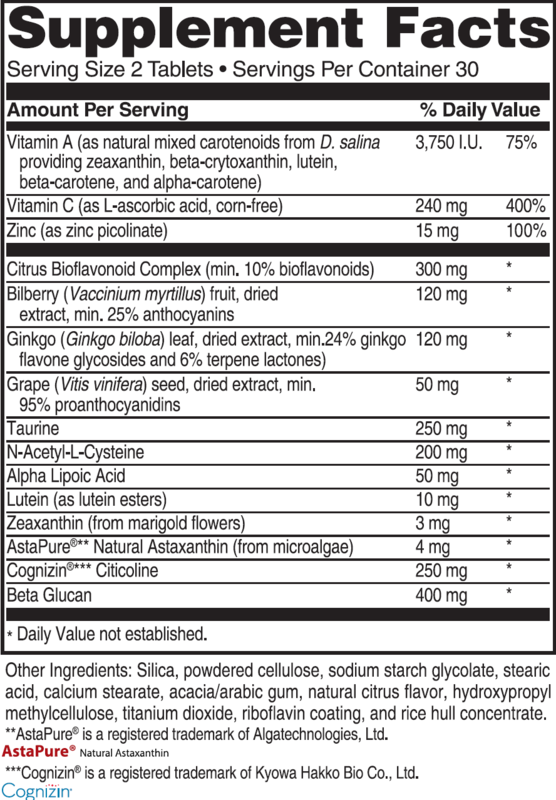 Alpha-lipoic acid (ALA): ALA is a potent antioxidant that travels across cell membranes to arrest excess free radicals. Known as the "Universal Antioxidant" because it recycles other nutrients, ALA further improves vision by regenerating vitamin C, CoQ10, Vitamin E and itself. 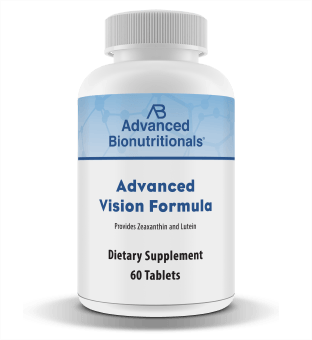 Advanced Vision Formula contains 50 mg of ALA.
To help your body absorb vitamin C, Advanced Vision Formula has citrus bioflavonoids. Commonly found in lemons and oranges, bioflavonoids protect your eyes from environmental stresses such as pollution. Cognizin® brand Citicoline gives you neuroprotective support for the nerve cells in your eyes against damage, degeneration or impairment of your vision function. Beta Glucan: is a powerful polysaccharide that helps slow the absorption of higher level glycemic index carbohydrates to promote eye health and function. N-Acetyl-L-Cysteine (NAC): helps boost levels of glutathione. It's actually a better source of glutathione because it's easier to absorb orally, and get made into glutathione right in your cells. NAC is included in the formula because it filters harmful excess UV light and protects your eyes from free radical damage. Vitamin A: Scientists have conducted numerous studies on Vitamin A — the most notable by Harvard5 on the startling link between Vitamin A and a slowdown in eyesight loss. *Daily Value not established. **AstaPure® is a registered trademark of Algatechnologies, Ltd. ***Cognizin® is a registered trademark of Kyowa Hakko Bio Co., Ltd.
Other ingredients: Silica, powdered cellulose, sodium starch glycolate, stearic acid, calcium stearate, acacia/arabic gum, natural citrus flavor, hydroxypropyl methylcellulose, titanium dioxide, riboflavin coating, and rice hull concentrate. … see everything in clearer, sharper detail. All in only two handy tablets per day. Of course you can buy many of these ingredients separately at your health food store. If you do, expect to pay over $150. Some of the branded nutrients in Advanced Vision Formula cannot be purchased in health food stores at all, making them 'priceless' to you. Take advantage of my offer however, and you'll save as much as 53%. I want to start improving my vision with Advanced Vision Formula today! If you want our lowest price per bottle, take our Best Value offer. Order a six-month supply of Advanced Vision Formula and you'll save 17% on each bottle, plus you'll get free shipping. That's a total savings of $78.95. Click here to save up to $78.95 and start improving your vision today! Great Value — Three-month supply. Save 10% off the single bottle price — a savings of $7.00 a bottle — and pay just $188.85 plus get free shipping for a total savings of $27.95. Good Value — One-month supply. Just $69.95 plus $6.95 shipping and handling for a total of $76.90. Click here to start strengthening and protecting your eyes today! My promise is simple — try Advanced Vision Formula today. And if you don't see clearer… enjoy improved night vision and get relief from eye strain, you can return it within 90 days of your purchase for a full and complete refund of your purchase price. Even if you're down to your last tablet! If Advanced Vision Formula isn't everything you expect, send the empty bottle back within 90 days and get all your money back. Including shipping and handling. You only pay return shipping. You will either notice a dramatic improvement in your eyes, or you won't pay a dime. I can't be any fairer than that. So, go ahead and request your risk free supply of Advanced Vision Formula today. Isn't it time you gained back the freedom and independence healthier eyes can give you? Simply call toll-free at 1-800-791-3395 or follow this LINK and we'll rush Advanced Vision Formula to your door. Our helpful agents are on call to assist you 24 hours a day 7 days a week. P.S. Advanced Vision Formula is the only formulation I recommend for people who want to enhance their vision. Take advantage of my risk free trial offer today. ACT NOW! Order Your Advanced Vision Formula Today!